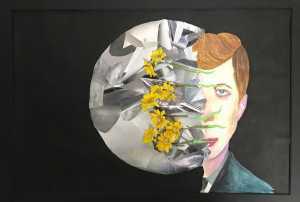 Art students from Sandwich High School have honored the legacy of President John F. Kennedy by creating artworks inspired by him. 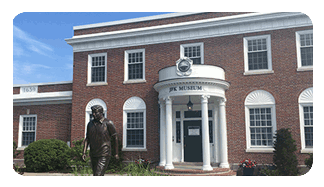 Art teacher Dineen D’Avena brought her students to the John F. Kennedy Hyannis Museum. Her students used the exhibits in the museum as the inspiration for their own artworks. 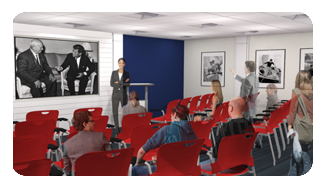 The art they created will be on display at the JFK Museum at 397 Main Street in Hyannis from April 28 to May 4. 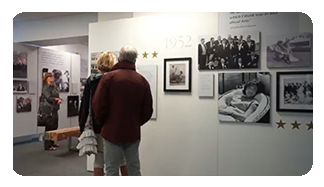 Her piece uses mixed media to show the contrast between the idealistic perception of President Kennedy’s marriage to Jacqueline Kennedy and the darker side of their relationship. She said that the images within the picture frames in her piece represent the media portrayal of the couple with the frayed rope representing the insecurities in the relationship. Sophomore Shelly Robinson-Matthews took a different approach, opting to crochet a dress inspired by Ms. Kennedy’s fashion sense. She said that the dress she made was based off one of the former first lady’s famous Christian Dior ball gowns. “Through this work I am trying to show how Jackie Kennedy was a fashion icon when she was alive,” she said. Shelly said that she has been crocheting for many years. 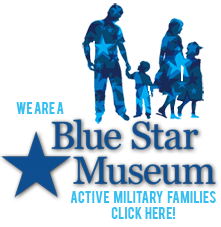 A reception for the art exhibit will be Saturday, April 28, from 2 to 4 PM at the JFK Museum.